Place peeled and chopped kiwi, 1/2 cup yogurt, 1/2 cup milk, 2 tsp honey and 1 cup ice in a blender. Blend until smooth. Pour equally into three 1-cup glasses and top with whipped cream, if desired. Repeat step 1 with the strawberry and banana flavored smoothies. Set in a row like a stoplight and serve! Optional: For brighter colors, add a few drops of food coloring (green to kiwi, red to strawberry, etc.) to the blender before blending. There were a lot of different kinds of creative parties at my college (e.g., root beer keggers and ugly sweater parties, to name a few). But the one I remember being pretty creative was the stoplight party. I have to admit – I never actually went to one of these parties. I know, lame. But something about exposing my relationship status so frankly wasn’t really my style. That doesn’t mean I didn’t think it was a creative idea. Plus, if I ever were to host a stoplight party, I know I’d go crazy over the theme and make every food and drink was themed like a traffic light. That’s just my way. If you’re planning to host your own stoplight party soon – and you’ve got the same themed-food-and-drink compulsion as me – I suggest you make this Stoplight Smoothie “Flight.” These yogurt-based fruit smoothies (made with Yoplait Light vanilla-flavored yogurt, one of my favorites!) are a delicious and colorful way to treat your single, taken and “complicated” guests. While I chose kiwi, bananas and strawberries as my red, green and yellow fruits, you can make these smoothies with whatever appropriately colored fruits you like. Heck, even veggies would work too, if you prefer vegetable-based smoothies. Just be sure to get the colors right (food coloring really helps out here) and serve them in a row, like a “flight” of beer, or your guests might miss out on the traffic-light reference. Whipped cream is optional, but I think it takes the flavor up a notch. 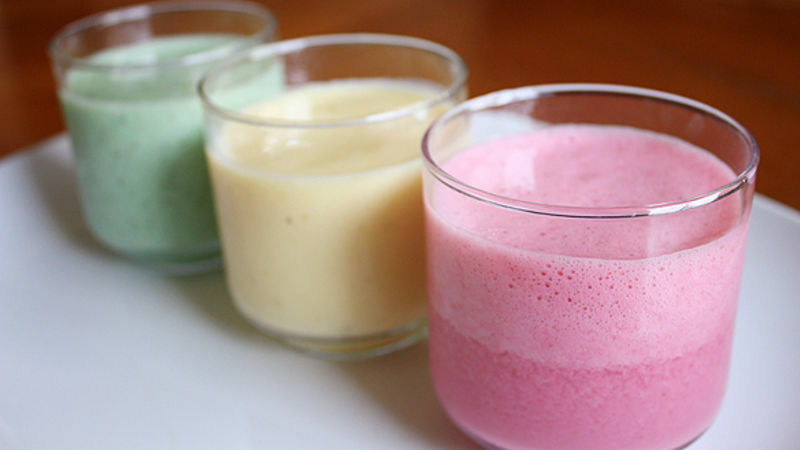 So the next time you host a stoplight party, serve up these sweet, yummy, colorful smoothies. For these smoothies, I’m definitely available.